What is it about the 1980s that has so sparked the imagination of TV writers in recent years? Is it the geopolitical tensions of yesterday, still echoing today? The massive success of one ’80s period piece in particular? The fact that we, as a culture, haven’t managed to jettison one of the era’s most odious symbols of excess and avarice? Whatever the answer, broadcasters—even outside the U.S.—think greed for teased-out hair, new-wave needle drops, and throwback junk-food packaging is good. Half-hour single-camera comedy. Three episodes watched for review. The words of Gordon Gekko reverberate throughout Black Monday, Showtime’s new Wall Street caper from David Caspe and Jordan Cahan. In fact, they’re spoken aloud by trader Dawn Towner (Regina Hall), and overheard by a screenwriter who’s visiting New York in the fall of 1986 to research for “the untitled Oliver Stone Wall Street project.” Were Black Monday a straightforward depiction of the year leading up to the catastrophic financial crash that occurred on October 19, 1987, this would be the point to cash out. 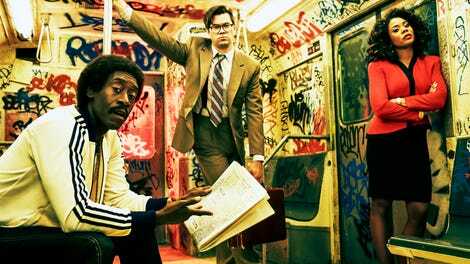 But Black Monday exists on the GLOW and Goldbergs end of the ’80s-on-TV spectrum, a tongue-in-cheek, cocaine-up-nostril comedy adding another gonzo project to the production profile of Seth Rogen and Evan Goldberg. Black Monday is all too aware that this is well-trod territory. It’s hanging a lampshade on it throughout that episode with the screenwriter (played by Paul Rust, one of the many familiar comic players on hand), which also takes its pains to unravel some complications involving stock-exchange shark Maurice “Mo” Monroe (Don Cheadle) and babe-in-the-woods Blair Pfaff (Andrew Rannells). Blair developed an algorithm that makes him a hot commodity on the street, but a not-so-chance encounter brings him into the fold at The Jammer Group, a firm run by Mo. There’s a period-appropriate slobs-versus-snobs dynamic at the center of Black Monday, with Mo’s upstart team—a roster that includes Hall, Paul Scheer, Horatio Sanz, Yassir Lester, and Eugene Cordero—standing in contrast to a WASP-y status quo represented by the likes of Kurt Braunohler and Ken Marino. As is its wont, Black Monday underlines this setup when Rust’s character mentions that Dawn would be the perfect inspiration for a movie that Mike Nicholls is working on—cut to Dawn hailing a cab while the theme Carly Simon’s theme to Working Girl, “Let The River Run” plays on her Walkman. What’s harder to square are the moments when the façade of excess and frivolity falls and Black Monday takes stock of the emptiness and the aching in its characters lives. Both the first and second episodes conclude with montages selling this point, mini-music videos illustrating that money hasn’t bought Mo happiness and that Dawn has made some serious compromises to earn her high-powered job, neurosurgeon main squeeze (played by Kadeem Hardison, who was a year away from donning Dwayne Wayne’s flip-up sunglasses in the real 1986), and Patrick Bateman apartment. These sequences are always jarring, as if Black Monday awoke from some weird dream in which Lehman Brothers was run by actual brothers—who spell their surname “Leighman” and are identical twins played by Ken Marino—and remembered it needed to provide something with a gravity befitting the Oscar-nominated star of Hotel Rwanda. But that dream is the show, and the characteristic that sets it apart from the crowded field of ’80s period pieces. 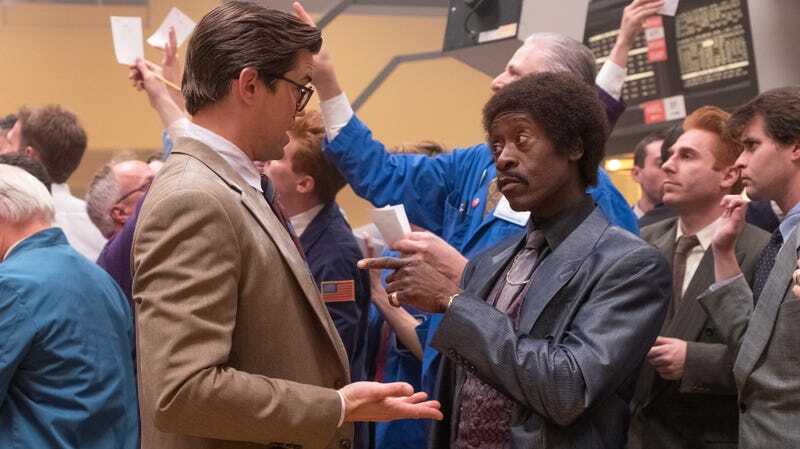 And Cheadle’s damn good in the whacked-out comedic portions of Black Monday, wearing a bulletproof bluster that fits Mo as well as the character’s Bijan suits. In the premiere, he has an exchange about doing blow with his robot butler that’s so hilariously matter-of-fact, it’ll make you forget that GLOW already did the AI-drug-sommelier gag two years ago. Sure, Black Monday needs to slow down every once in a while or risk exhaustion; when Rogen and Goldberg are behind the camera for the premiere, they transfer the chaos of the trading floor to practically every other setting, pushing things right up to the edge of shrill. In its first three episodes, the show hasn’t figured out a proper balance. The challenge for the remainder of the season is one that should be familiar from Black Monday’s many sources of inspiration: What are you supposed to do when the party stops?